The ultimate tender, moist cake perfect for birthdays and special occasions, yet simple enough for everyday cupcakes. 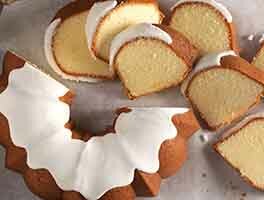 Vanilla and almond flavors combine to give you smooth, mellow flavors reminiscent of your favorite bakery cakes. 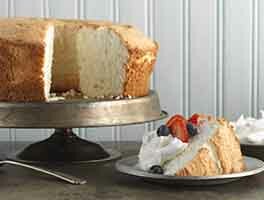 This recipe uses King Arthur Unbleached Cake Flour Blend, which results in a high rising cake with a moist, tender crumb. The cake also uses the paste method, so no need to cream the butter and sugar. We do recommend a stand mixer for this cake, or a sturdy hand mixer. Two 8" or 9" round layers; one 9"x 13" x 2" sheet cake, or 20 to 24 cupcakes. Pour the batter into the prepared pans. Bake for 25 to 30 minutes for 8" or 9" rounds; 23 to 26 minutes for a 9" x 13" x 2" sheet cake; or 20 minutes for cupcakes. A toothpick or cake tester inserted into the center will come out clean when done. Remove from the oven, remove from the pan, if desired (not advisable for a 9" x 13" sheet cake), cool on a rack, and frost. Yield: Two 8" or 9" round layers; one 9"x 13" x 2" sheet cake, or 20 to 24 cupcakes. 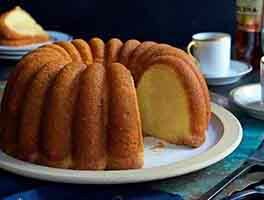 To make a classic yellow cake, use 3 whole eggs and 2 egg whites instead of 4 egg whites and one large egg. Delicious with rich chocolate icing! This cake is very tender. We advise handling layers with care when turning them out of the pans; and if you've made a 9" x 13" sheet cake, it's best served straight from the pan, to avoid crumbling. This cake was very well received ,however: I had to make it twice. The first time it seemed to dense and too sweet for my taste. I cut out a sliver and tasted it when I felt it hadn't risen enough. My baking instincts were correct. It was a bit dense and too sweet for me. The second time I used 1/3 c sugar less. I also did as follows: Suggestion: I would like to suggest that the directions be clearer about the speed in which to beat in the eggs . The first time I made it ,I beat it on slow with one egg white at a time as mentioned with the dry ingredients. The second time I beat it on a medium high speed. That seemed to add more air and made a lighter cake. I am wondering if it could have been even on on a higher speed? It would be helpful if the directions could specify. All and all the second time made a delicious cake. I used drained macerated strawberries and whip cream to fill it with. I made a whip cream froasting that I added the juice from the macerated berries into to give flavor and a hint of pink color . Alls well that ends well. (I froze the first rounds and will cut out small circles with a biscuit cutter for another dessert using fresh fruit and cream). Thanks KA for always reading your customers comments. Many websites do not respond. I made these into cupcakes. The flavor and texture of the cupcake was very good. I did run into a couple problems though. For some reason, the center collapsed while cooling and the outsides got a little browner than I like. I baked at 350 for 19 minutes and the toothpick came out clean. I followed the directions almost to a T. Since it said I could use yogurt or whole milk, I decided to use half whole milk and half sour cream. Not sure if that could have affected it or not. Could I have not mixed enough or mixed too much? I'm used to cakes where you mix just until combined. Could the temperature be too high? My oven is new though so I wouldn't think it would need calibrating. I liked the taste and texture so I want it to work but if they keep falling like this than I don't think I will keep using it. Any ideas? We're glad you enjoyed the flavor and texture of these cupcakes, Beth, but we're sorry to hear they fell in the middle. Usually, falling happens for one of four reasons. Underbaking, overmixing, too much liquid, or too cool of an oven. It may be worth grabbing an inexpensive oven thermometer next time you're at the grocery store just to make sure your oven is reading true and stays consistently at a temperature while baking. Now my go-to White cake recipe. 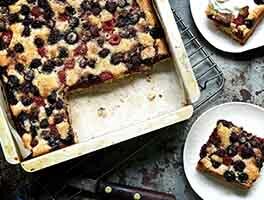 I've tried for years to find a great recipe and this is it! Simple to make and it came out perfectly. I made it as written and would not change a thing. Frosted it with strawberry frosting and it was beautiful and delicious!!! After many failed attempts at making a perfect white birthday cake I found this recipe and I've never looked back. The cake is tender, delicious and gets rave reviews every time I bake it. 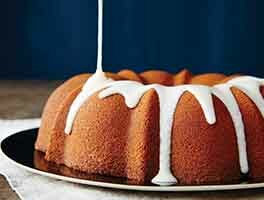 I'm making a unicorn cake for my daughter's birthday this year and I need a tall cake, so wondering if I can bake this cake in 6" round baking pans instead of 9". How many 6" rounds would the batter fill and how much would I have to adjust the baking time? Any advice appreciated! I'm pretty sure I did something wrong, based on the reviews. My cupcakes were like rocks not tender at all (I weighed by grams and used cake flour.) what did I do wrong? Oh my goodness! This was a delicious white cake. It is the best cake I have ever baked. It would be a perfect wedding cake. I frosted it with Swiss buttercream. This recipe makes an exceptional cake, it's tender with an oh so delicate crumb. That said, this is NOT a white cake, it's a butter cake. The unbleached cake flour adds color, the yolk adds color, and the vanilla adds color. The cake also tasted strongly of butter and I don't even use a high quality/European style butter. 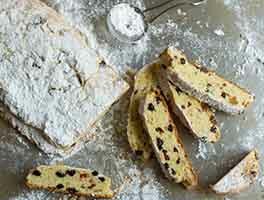 Would it be possible to use shortening in this recipe? If so, would it be 1:1? Overall, I'm very pleased with my first foray into the "reverse creaming" world. I recommend giving this one a try- just be sure to use KAF Unbleached Cake Flour as directed, not a different cake flour(!). Thanks again KAF! Excellent cake. So moist and delicious. Defiantly on the top of my list. I had some frozen Vanilla Swiss Meringue Buttercream that I defrosted. I did use one cup of buttermilk in place of the yogurt it milk ingredient. Perfect flavor and not too tender. Love it with the Swiss meringue buttercream!